Discover Mendoza region in Argentina, with our travel agency in Buenos Aires. The Land of Sun and Good Wine, Mendoza is located at the heart of an exceptional region and offers both the prodigious landscape of the Andean range and the delights of wine. Mendoza is on the same latitude as Buenos Aires, but thousands miles west, at the base of the Andes mountain range and close to the Chilean border (Santiago is 200 miles away.) It sits at 2,300 feet above sea level. 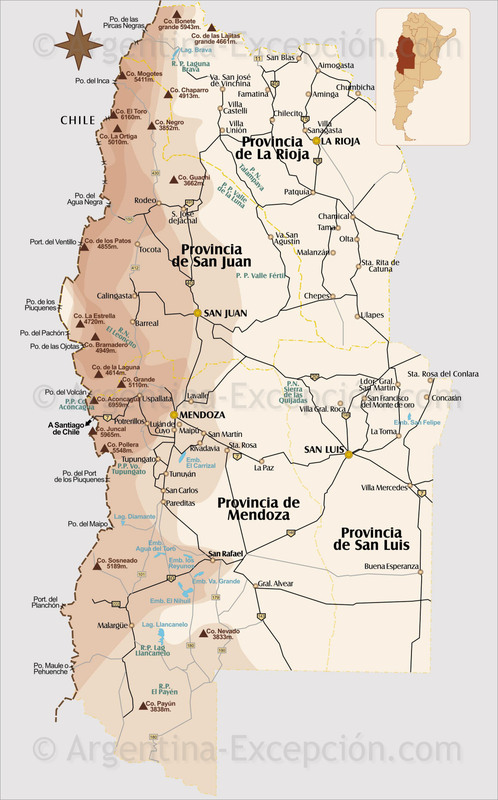 Mendoza is located in an arid and seismic zone. However, thanks to irrigation canals that capture the water of the rivers coming from the mountains, the area became a real oasis with a significant horticultural production. The shade of the big trees protects the city from the blazing summer sun and gives Mendoza a pleasant verdant look. In the summer, temperature ranges from 64 to 91°F and from 37 to 60°F in the winter. From May to September, it snows in the Andean range, limiting the possibilities of hiking in the mountains. When to go to Argentina. Parque San Martin The Spanish founded the city in 1561, on a land where indigenous peoples (Huarpes, Incas, Puelches) had invented an ingenuous irrigation system. Thanks to that, the new colony was to become an important agricultural production center. In 1813, General San Martín became governor of Cuyo. A few years later, he raised the Army of the Andes in Mendoza and became the hero of the wars against the Spanish for the Independence of Argentina, Chile and Peru. Even though many historical buildings were destroyed in the 1861 earthquake, Mendoza remains a pleasant and lively city with numerous terraces and parks shaded by big trees. This is an ideal starting point for a wine tour and for treks in the mountains. The Grape Harvest Festival, from January to March: the oldest Argentine festival, the Grape Harvest Festival is a well-established tradition which starts in January with the selection of the candidates for the National Vintage Queen. It ends at the beginning of March with a big concert in the Teatro Griego Frank Romero Day. 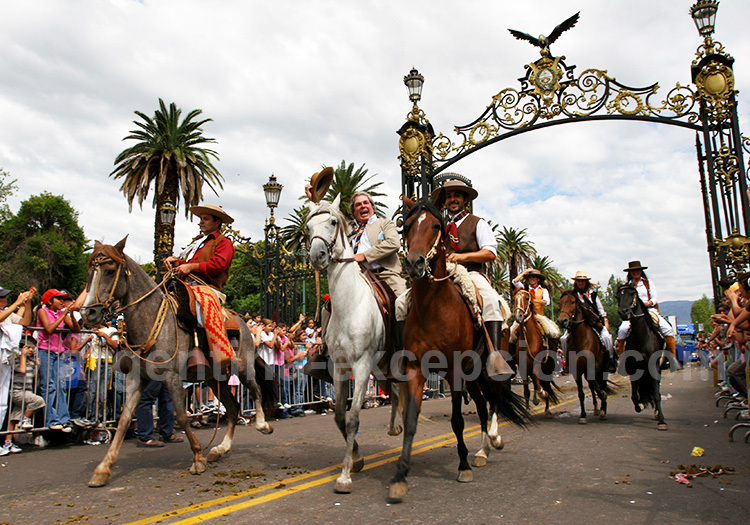 The Vintage Celebration (Fiesta de la Vendimia) takes place not only in Mendoza but in the entire Province. Holy Week : processions, and more recently concerts in churches, Sacred Art exhibitions, guided tours and other activities. 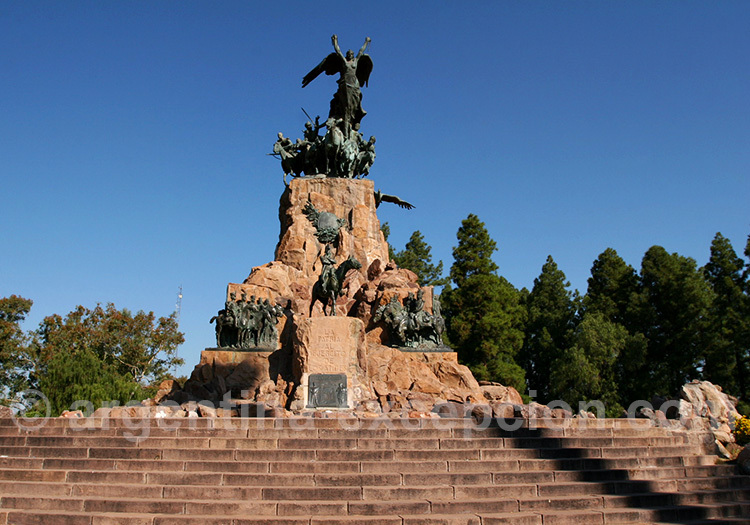 MUSEUMS AND MONUMENTS : WHAT TO VISIT IN MENDOZA ? 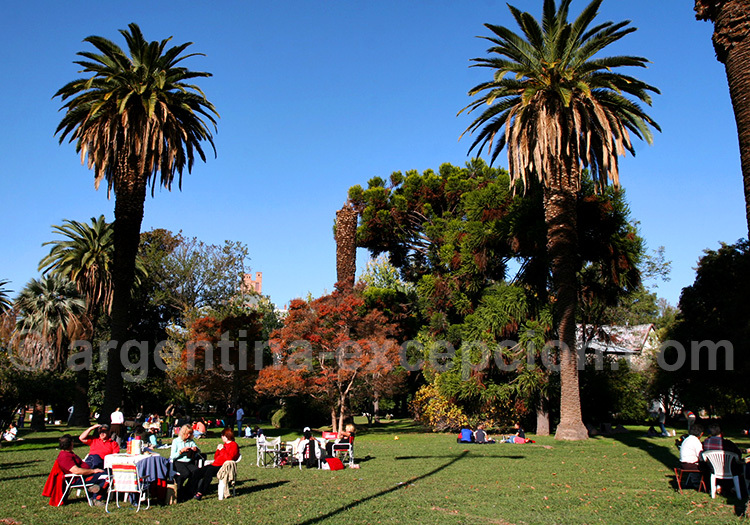 Independencia Park : The park is the true center of the city, where Mendocinos gather. Underground, the Municipal Museum of Modern Art displays temporary exhibitions. Four other parks surround Independencia Park, including España Park and its beautiful mosaics. General San Martín Historical Museum : This museum honors The Liberator and displays objects that belonged to him or that can help understand his times. San Francisco basílica : The basilica shelters the Virgin of Cuyo, patron of San Martin’s Army of the Andes and is considered miraculous. This is a place of high devotion. 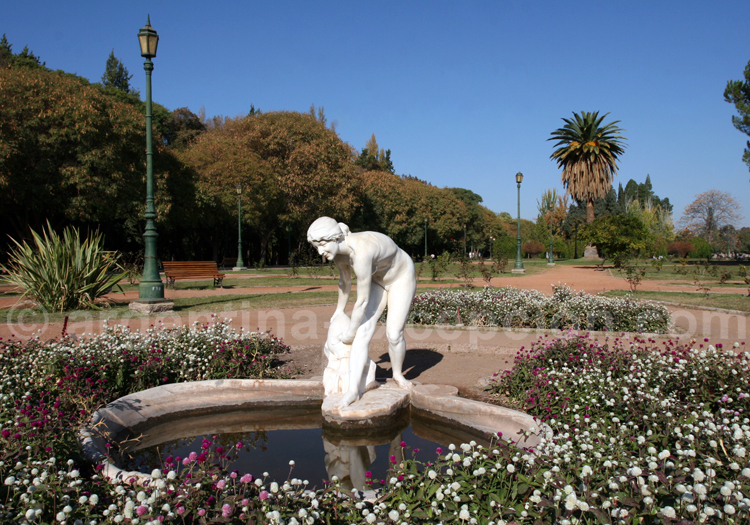 General San Martín Park : This beautiful and large park was designed by French landscape architect Charles Thays. Ten blocks away from the center there is the lake, the rose garden, the zoo and the Cerro de la Gloria, a tribute to the Army of the Andes, and a hill which offers a great panoramic view of the valley. Foundational Area : In 1861, an earthquake destroyed Mendoza’s old city center. The museum protects excavations of the colonial cabildo (town council) and the Jesuit Church. 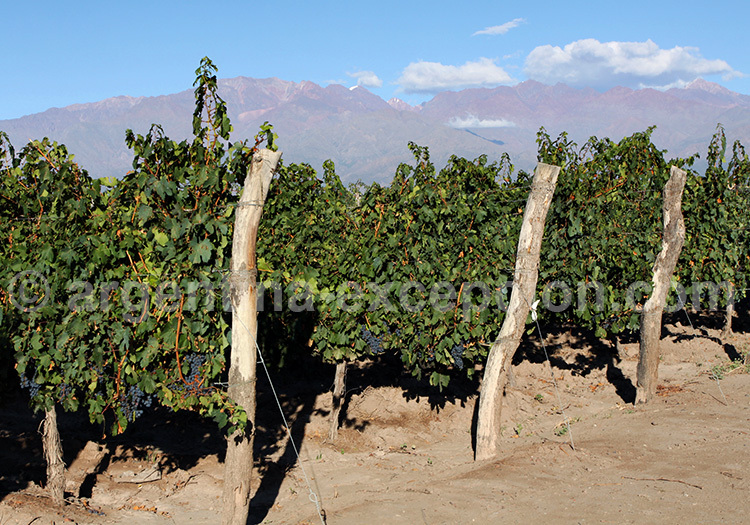 In the nineteenth century, vine-stocks were imported from Europe to develop wineries in the area of Mendoza, whose topography and climate were perfect. Argentineans are wine lovers, in keeping with the tradition of their Italian, Spanish and French ancestors. In the 1890’s, wine growers and investors started to pay more attention to quality and began to produce wines that are now famous worldwide, including malbec, a wine that has found its chosen land in Cuyo. Almost three-fourths of Argentina’s production comes from there and Mendoza has been listed one of the eight World Wine Capitals. 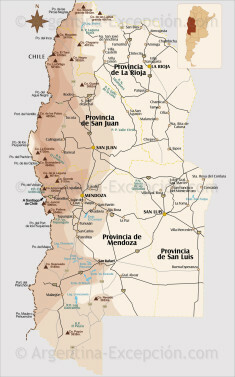 Most of the wineries along the wine route are clustered a few miles away from the province’s capital, in Luján de Cuyo and Maipú. In Maipú, the bodegas Zuccardi or López are open to the public. In Luján de Cuyo, one can visit the wineries: Tapiz, Ruca Malen, Terrazas de los Andes, Achaval Ferrer, Catena Zapata (with its pyramidal architecture), and others. Further south, the vineyards in Valle de Uco are as promising with the wineries Altus, Andeluna, Antucura, and Salentein all open to visitors, where one can taste their wines with the Andes mountains in the background. Heading to San Rafael, we recommend stopping at Viñas del Golf, Bianchi, Roca or Goyenechea. Several of these wineries are excellent places to stop for lunch or dinner. 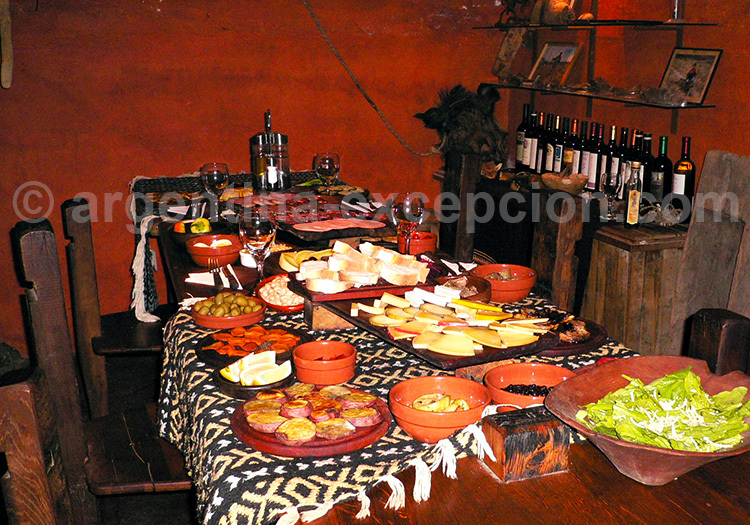 GASTRONOMY : WHAT TO EAT IN MENDOZA ? Mendoza and its outskirts are home to some of the best restaurants in Argentina. With the development of oenotourism, several hotels and wineries opened restaurants to take advantage of the quality of the local products and fine wines. 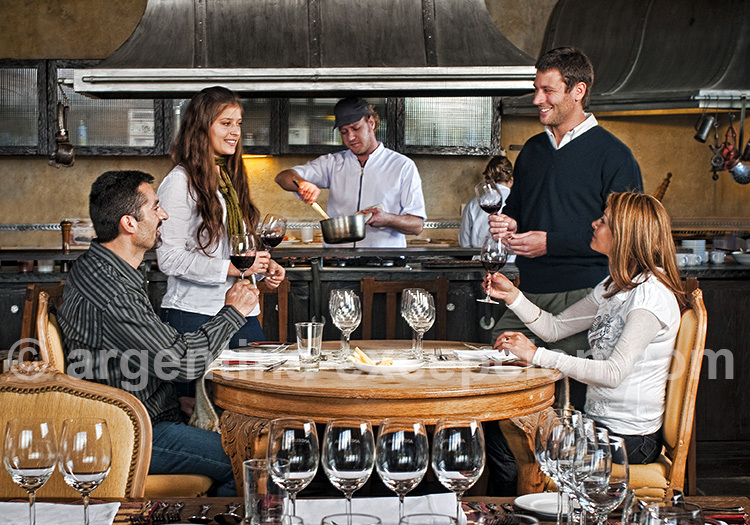 There is not a culinary specialty in Mendoza, but there are many places where one can enjoy asado, Italian cuisine and typical Argentine “Criollo” dishes, as well as excellent gourmet cuisine, all accompanied by fine local wines. Mendoza is the main wine-producing region in Argentina with 150,000 hectares of vineyards and over 1,000 wineries (most of which are open to the public). The most common vine-stock, now emblematic of Argentina, is the Malbec. For more information, see our selection of wineries and the section on Argentinian wine. RESTAURANTS : WHERE TO EAT IN MENDOZA AND ALONG THE WINE ROUTE ? 1884 Francis Mallmann : this was the first restaurant to open in a winery, in Godoy Cruz. The atmosphere is cozy and the food is prepared by a famous Argentinean chef; one of the few to have been awarded a prize in France. The restaurant serves local products and boasts a large wine selection.this was the first restaurant to open in a winery, in Godoy Cruz. The atmosphere is cozy and the food is prepared by a famous Argentinean chef; one of the few to have been awarded a prize in France. The restaurant serves local products and boasts a large wine selection. 743 Msnm Bistró : the chef Lucas Bustos prepares harmonious food-wine combinations in his 1970’s-decorated restaurant in Mendoza. Bistro M : the Park Hyatt restaurant offers oven-cooked local specialties with a French touch. Over 2,500 bottles on the wine list. La Marchigiana : for years, one of Mendoza’s best places for Italian food. Almacen del sur : located in Coquimbito, on Maipú’s Wine Road, 15 minutes away from Mendoza, Almacen del Sur is both a producer, a delicatessen and a restaurant. Local fresh products guaranteed. Cavas Wine Lodge : the restaurant of this high-standard hotel, located in the middle of the vineyards in Luján de Cuyo, has everything to satisfy the most demanding palates. The Cavas Wine Lodge is listed “Relais & Châteaux” (French “Lodge and Castle”). La Bourgogne : the French chef of the Buenos Aires restaurant La Bourgogne, Jean-Paul Bondoux, is the consultant of the Carlos Pulenta winery’s restaurant, located in Luján de Cuyo. Gourmet French cuisine in a dream landscape. HOTELS : WHERE TO STAY IN MENDOZA AND ON THE WINE ROAD ? Park Hyatt Mendoza Hotel: the prestigious hotel of Mendoza offers restaurants, a spa, a swimming-pool, a piano bar and a casino. Huentala Hotel Boutique, Mendoza: this high-quality hotel was creatively renovated in the historic center of Mendoza. It has an excellent restaurant and a 500-wine bottle selection. Hotel Cavas Wine Lodge, Luján de Cuyo: a little palace in the middle of the vineyards with a view of the Andes. 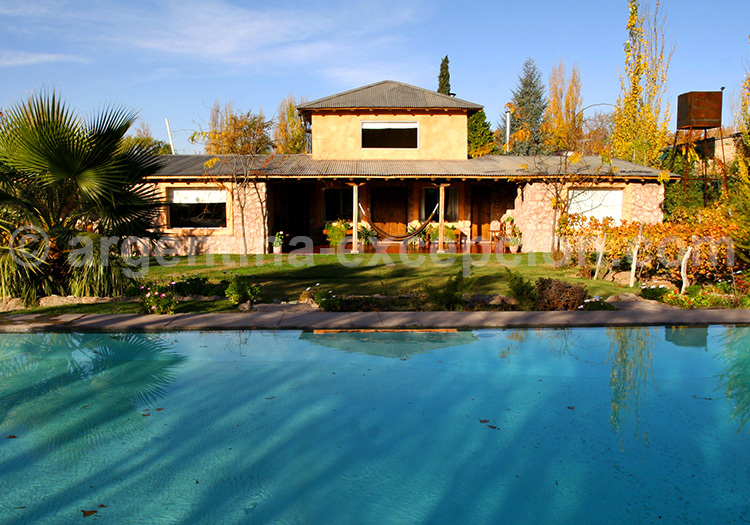 Club Tapiz Bodega Hotel, Maipú: an elegant residence in the vineyards with a restaurant, a spa, a swimming pool and a fitness room. Finca Adalgisa Hotel, Chacras de Coria: a very glamorous hotel of eight rooms and a swimming pool surrounded by two hectares of Malbec vineyards, the emblematic local vine-stock. Hotel Valle de Uco Lodge, Tunuyán: A hotel located in the best vineyards of the area, with a view of the Tupungato volcano. A recommended gastronomical stop. 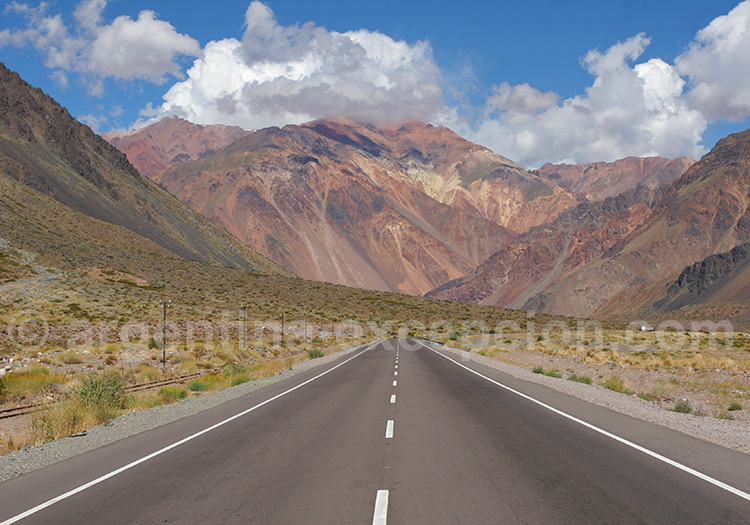 TRANSPORT : HOW TO GET TO MENDOZA ? By air : Francisco Gabrielli International Airport, El Plumerillo, is located 7 miles away from the center of Mendoza. Daily direct flights to Buenos Aires and Santiago de Chile with Aerolíneas Argentinas and Lan. Sol Airlines flies from Mendoza to Córdoba and Rosario. By bus : several buses to the cities of the North, to Chile and to Buenos Aires (a 14 to 17 hour trip). Beware of winter weather conditions when crossing the Andes: the normal trip to Santiago is 7 hours long but the pass can be closed in case of heavy snowing. Andes’ Road to Chile : The RN-7 to Chile passes through the range and the 110-mile trip to the Chilean border is incredibly beautiful. A hundred miles away from Mendoza, the last village, Uspallata, was once a very important mining center. The road then continues to the small ski resort of Los Penitentes, just a few miles before reaching Puente del Inca. This bridge was dug into the rock by warm sulfuric waters and was used by the Incas as a natural access route. One can swim in the thermal water pools while admiring this natural orange sculpture. The RN-7 leads to the frontier post Las Cuevas, 10,000 feet above sea level. 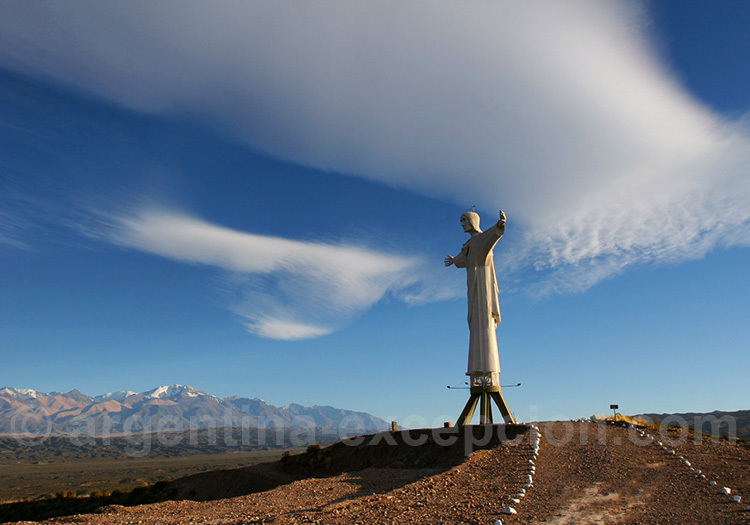 The Cristo Redentor, built 13,000 feet above sea level, pays tribute to San Martin’s Army of the Andes. The 1.8-mile tunnel of Cristo Redentor links Argentina to Chile. Aconcagua Provincial Park : The RN-7 crosses the Aconcagua Provincial Park, which encircles the access to the highest summit of Americas: the Aconcagua, 22,831 feet above sea level! The trek is recommended for experienced hikers only, not so much for its technical difficulties but for the effects of altitude and the violence of the winds. The trekking season stretches from November 15th to March 15th. One can also simply enjoy a 1.2-mile trek to Los Horcones lake and admire the Aconcagua from below. Laguna Diamante : Located south of Mendoza, in the department of San Carlos, Diamante Lake (10,662 feet above sea level) evokes the shape of a diamond due to the reflection of the Maipo volcano. It also was the scene of an epic episode of the Aéropostale, when the French pilot Henri Guillaumet crashed during winter 1930 and spent a week fighting off the cold before being found by a villager. This accident was described by Antoine de Saint-Exupéry in his novel, Terre des hommes (Wind, Sand and Stars). Mountain Sports : The province of Mendoza offers a wide range of out-door sports: climbing, rafting on the rivers of Mendoza and Diamante, biking, horse riding, trekking and of course skiing and enjoying winter sports. The highest ski resort is Las Leñas, 276 miles south of Mendoza, and it has marvelous powder. Close to it, one can admire beautiful landscapes: Molles thermal baths, the high-altitude lakes (Laguna Escondida, Laguna de la Niña Encantada) and Pozo de las Animas, two natural wells (the largest has a 650-feet diameter). El Payén and Laguna de Llancanelo Provincial reserves : Located south of Malargüe, the park El Payén or La Payunia protects more than 800 volcanic cones! 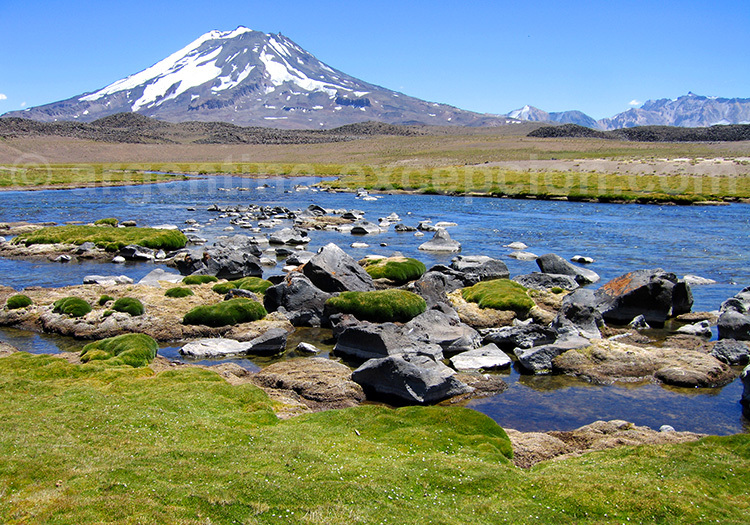 A lunar landscape of lava flows and is inhabited by guanacos. A few miles away, Laguna Llancanelo is a salt-filled lake with numerous birds. Wine and Gastronomy in Mendoza and Salta : a 13-days trip with a driver-guide through Argentina’s best wineries and exceptional landscapes. Wine and Gastronomy in Argentina and Chile : a 12-days trip with a driver-guide to visit exceptional wineries on both sides of the Andes, from Luján de Cuyo to the valley of Casablanca, near the legendary Valparaíso. Category of accommodation: exceptional. 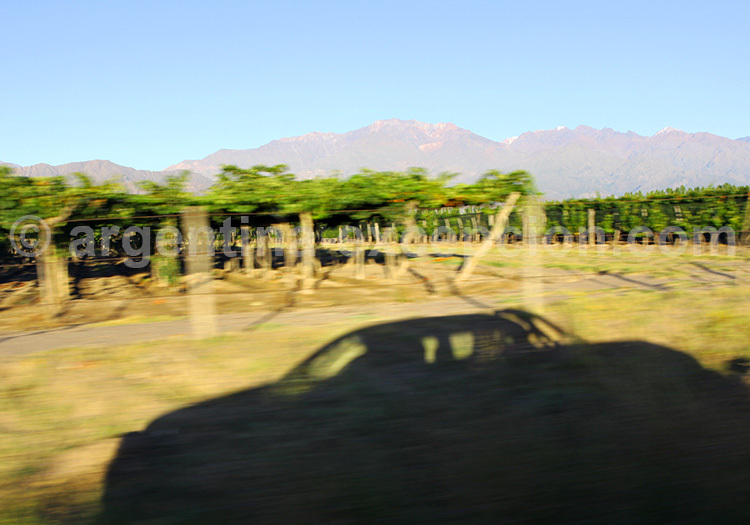 Trip from Mendoza to the Moon Valley : a 10-day fly-and-drive trip to explore the region of Cuyo, the wineries, the Andean range, and the National Parks. In the footsteps of Mermoz, Guillaumet and Saint Exupéry : an exceptional 7-day trip in the Mendoza region, looking for witnesses of Aeropostale, and through the wineries.